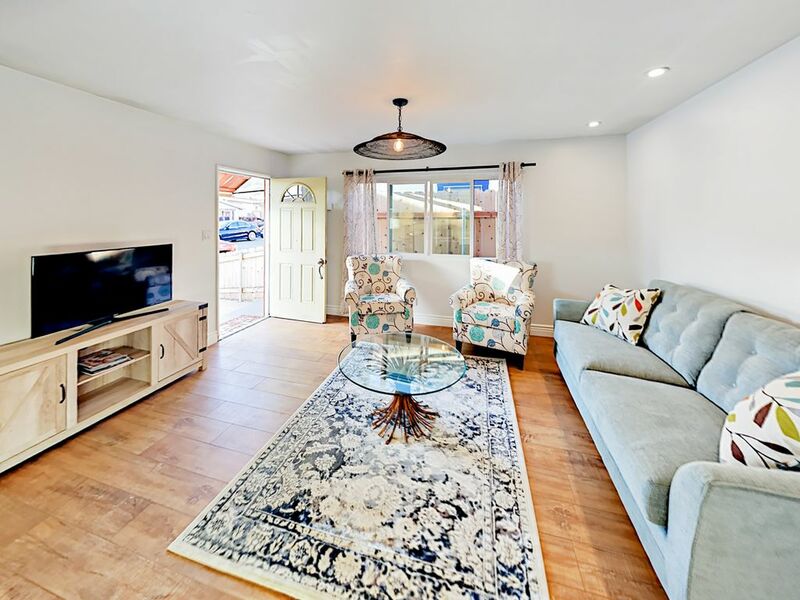 Situated on the dreamy Central Coast, this single-story 2BR cottage boasts a completely renovated interior with hardwood floors and a gourmet kitchen -- the ultimate beachside retreat for an extended stay. Kick back for a relaxing afternoon on a private patio in the fenced yard equipped with a fire pit. Explore area hot spots conveniently located within walking distance. The sands of Shell Beach are also just a 5-minute stroll from your home. An open floor plan provides plenty of space in this one-story abode. Relax on the couch and two accent chairs to enjoy a movie night on the 40” flat screen TV. The well-equipped kitchen is outfitted with granite countertops, bright white cabinets, and stainless steel appliances - including a gas range. Enjoy meals at the dining table with seating for five. This home has two bedrooms that sleep up to four guests. The full bathroom is stocked with a complimentary supply of toiletries and bath amenities, as well as plenty of hotel-quality towels. In the master bedroom, you’ll find a plush queen-size bed, plenty of closet space for a long stay, and access to the patio. Find a restful slumber in the second bedroom that features a queen-size bed and patio access. The bathroom is outfitted with a tub/shower combination. Children, pets, and adults alike will enjoy the fenced yard and patio area equipped with a gas fire pit. Gather on four chairs under an umbrella equipped with solar-powered LED lights for evening illumination. A built-in doggie door allows pets to come and go as they please. Guest amenities include a washer/dryer and complimentary Wi-Fi. Street parking is available on a first-come, first-serve basis. Want a taste of local flavor? Walk 2 minutes to Zorro’s Cafe & Cantina or meander 7 minutes to Shell Beach Brew House. Walk 4 minutes to Shell Beach Liquor & Deli, where you’ll find wine and liquor as well as a breakfast and lunch menu. Take a casual 11-minute stroll down to Margo Dodd Park; enjoy breathtaking ocean views from the covered gazebo or check out the snorkeling and tide pools. It’s adjacent to Dinosaur Caves Park, an 11-acre bluff-top park with a themed play area complete with a gentle dinosaur, huge dinosaur eggs, and swings. You’re also just an 11-minute walk from Eldwayen Ocean Park, a perfect picnic destination. Along your way, be sure to take note of the Chapman Estate, a centerpiece of the Shell Beach community since 1962. Drive 8 minutes to the Pismo Beach Pier, 15 minutes to Avila Beach, or 7 minutes for shopping galore at the Pismo Beach Premium Outlets. Time your visit right and explore the seasonal Monarch Butterfly Grove, where an average of 25,000 orange and black Monarch butterflies gather in the Eucalyptus trees. Nice place for couple with a dog. Looks like it was newly renovated and well-kept. Two small bedrooms with closets and a comfy open kitchen/living area. Nicely tended back patio. Beautiful ocean overlook at the end of the street. Properties are closely packed together in this neighborhood, but it was very quiet. Small quibbles: wish for a king bed, shower pressure was a bit low, kitchen faucet handle was loose (I'm sure if we had made it known, they would have come fixed it.) Ate at dog-friendly Zorro's at the end of the street. Walked to dinosaur park overlook to run the dog. Short drive to Pismo and Avila, both charming for lunch and strolling. Very pleasant. We would return. The rental was great. It was clean. Close to restaurants, stores, and the beach. The management company was responsive and the rental was nicely stocked and welcoming. This home is in a great location, close to the beach, restaurants, highway 101 and parks. It was clean and well stocked. Parking is on the road but never was a problem for us to park right in front. The furnishings were nice, comfortable and clean. We were visiting my daughter at Cal Poly and it was a quick easy drive to go see her. I would stay here again.